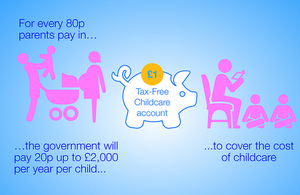 You may have seen in the press the news that nurseries can now offer families 30 hours of funding for their childcare. At The Lanes we will be participating in this scheme however we cannot offer 30 hours as we are not open that length of time in any one week. We can however offer eligible families 24.5 hours and the remiander can be used at another setting. This equates to £120 a week (or c.£6,000 a year) for each parent over 25 years old or £112.80 a week (or c.£5,800 a year) for each parent between 21 and 24 years old. Find out more on the government website! National Education Grant (NEG) funding. All children attending a funded setting such as ours are entitled to claim the National Education Grant. This is paid from the term after your child’s third birthday up to a maximum of 15 hours per week and can be taken in 3 hour morning sessions. Please be aware that we do charge an additional service fee for the extra 15 minute per morning, craft materials, local visits and extra curriculum activities. Your child is entitled to 38 weeks of free part time nursery education a year (15 hours per week) at The Lanes where we deliver the Early Years Foundation Stage. FEET Funding for 2 year olds. Children entitled to FEET funding can access this at The Lanes Kindergarten. Children are entitled to 15 hours per week if their parents are on a low income or meet other criterion as required by Surrey Early Years. If you think that this may apply to you please speak to Michelle W or Sharon who would be happy to complete the relevant paperwork. All information can be found at www.surreycc.gov.uk and search for FEET funding. Vouchers are a way of funding your child's Pre-school education. The vouchers are issued through your employers who deduct the money from your salary before income tax and national insurance thus saving money because less income tax and national insurance is payable to HMRC.